Art Battle Canada is coming back to Ottawa on October 1st! We can’t wait to host 12 of Ottawa’s best and bravest artists in a one night tournament of skill and courage. While the paint is still wet, your votes decide who will be the next Art Battle Ottawa Champion. This will be a very special event, a fantastic celebration of painting, creativity, courage and community! 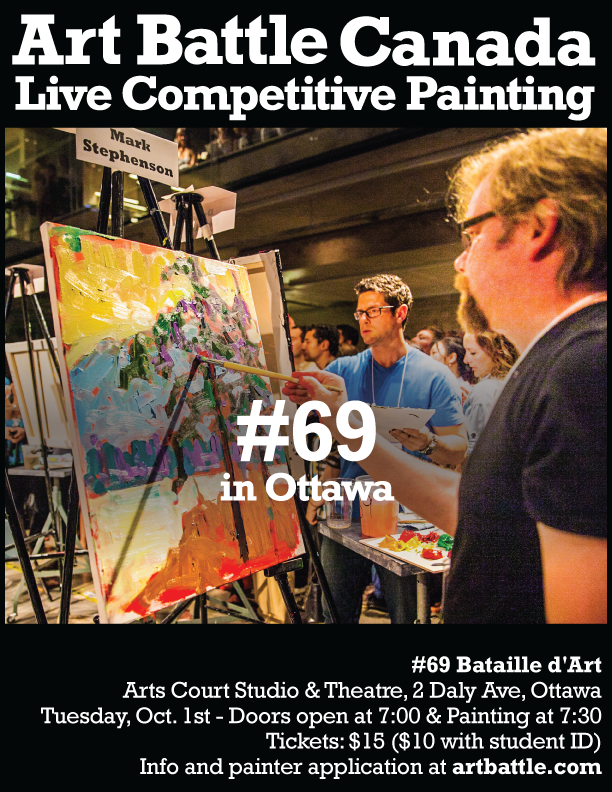 Art Battle Canada produces monthly events all over Canada and we’re so excited to be returning to Canada’s capital!What is Art Battle?Art Battle is a live competitive painting event. 12 painters will create the best work they can in 20 minutes. As they work, the audience moves around the easels, allowing them an up close view of the creative process. The medium used is acrylic paint and the tools allowed are brushes, palette knives or any other non-mechanical implements. At the end of the round, the audience votes for their favourite painting and can also later place bids in a silent auction to take the paintings home. Informations sur l’événement:Art Battle/Bataille d’Art est un événement compétitif de peintures créées en temps réel. See you on October 1st!